Disasters stir a desire to help, and the record-breaking rains that triggered massive flooding in western Japan — killing 200 people and inflicting widespread destruction — have prompted groups of volunteers to take action, seeking to offer rapid assistance to communities hit by the calamity. But areas and organizations hosting volunteers are warning them to avoid hindering relief operations, and encouraging them to engage in recovery efforts that are truly needed. As of Thursday, some 7,000 people remained in shelters, according to the Fire and Disaster Management Agency. American Joy Jarman-Walsh, 49, a long-term Hiroshima resident who teaches tourism and business at Yasuda Women’s University, is volunteering now as she did four years ago. “It’s really heartbreaking because you’re helping dig mud out of people’s houses that (they) were still able to live in, and then other local people were saying, ‘You know, after this, there’s no way we can move because we can’t sell the house, we can’t even rent it out… we can’t get insurance,’ ” she said by telephone. This week Jarman-Walsh and other local residents were clearing debris, mud and sand from clogged drains in her neighborhood. She said this was the same problem faced by the elderly residents four years ago, when they needed help shoveling mud from their houses. “That was what was really needed to get those neighborhoods back functioning,” she said. For next Monday — which will be Marine Day, a national holiday — she is organizing a cleanup project at Tsutsumigaura, the biggest swimming beach on Miyajima Island. She is asking anyone interested in participating to bring gloves, garbage bags, hats, sunscreen and water bottles to the beach at around 8 a.m.
She also suggested that people who want to officially volunteer in cooperation with municipalities get insurance, which is available in Hiroshima for residents of Japan and is mandatory for official volunteers. 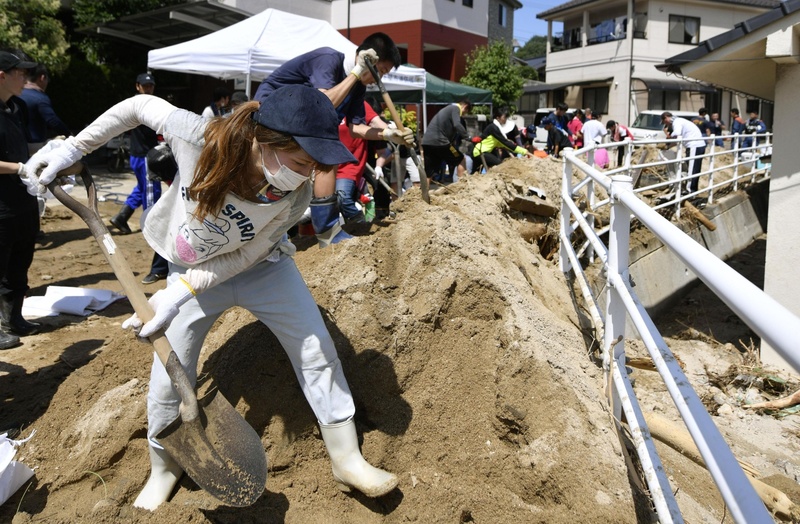 The city of Seiyo in Ehime Prefecture has been accepting help from individuals, with cleaning and moving furniture and other heavy objects, since Wednesday. More than a hundred volunteers showed up within the first hour after the announcement. Although help in flooded areas has been requested, some municipalities are warning individuals not to deliver support no one has asked for. Earlier this week, for example, the Kurashiki Municipal Government in Okayama Prefecture asked volunteers via social media not to leave relief supplies at one of the city’s bridges, saying the packages were blocking a street and hampering rescue operations being conducted by the Self-Defense Forces. And at evacuation centers, some people were seen delivering winter clothing — in the middle of summer. On Wednesday Kurashiki officially began accepting volunteers, but requires them to be city residents. Some of the roads connecting disaster-hit areas with other areas have been damaged, and accepting people from outside of Kurashiki could hinder the transport of supplies, the city’s social welfare council said. “The needs differ in all areas so it’s important to check information on what support is needed at volunteer centers,” said Tsuneyuki Hirai of the Japan National Council of Social Welfare. Hirai said it is difficult to offer aid that matches individual community needs. “Some centers had trouble with allocating volunteers in the past when too many people came to help,” he said. Volunteering is helpful but people can also provide support by donating to charities or directly to the affected municipalities, he added. Many charities are calling for cash donations that will be used to meet survivors’ immediate needs: food, fuel, clean water and hygiene products. In addition to volunteers, emergency aid organizations are also operating at full throttle. Peace Winds, a nongovernmental group, is delivering relief supplies to the hardest-hit areas, including isolated evacuation centers in Kurashiki’s Mabicho district and the city of Mihara in Hiroshima. The group has also dispatched a doctor to Mabicho. “We’ve been receiving calls for assistance from small shelters at community halls that aren’t designated by local governments — but since they are not registered, evacuees there couldn’t receive emergency food aid,” Takahashi said. Peace Winds is also cooperating with companies that have the capacity to deliver relief supplies in bulk. Doctors Without Borders has dispatched two research teams to the disaster-stricken areas — one to Hiroshima and Okayama and the other to Ehime Prefecture. It is also working with the Japan Disaster Medical Assistance Team (DMAT) and the Japanese Red Cross Society, which send out medical aid while the situation is considered an emergency. “In this stage, we’re trying to estimate the scale of the disaster and check what kind of medical help is needed, to make arrangements,” a spokesman for Doctors Without Borders said by telephone.